Feel Free Nutrition Protein Porridge is a delicious porridge, characterized by a large content of protein and ingredients supporting the growth of muscle tissue. It can be successfully included in the daily menu. A frequent excuse of many people who fail to go on a diet is the claim that diet food is tasteless and lacks nutritional value that is necessary for everyday functioning. To change the social awareness once and for all, food manufacturers are outdoing themselves in inventing newer and tastier desserts, snacks, and ready meals. One of the most popular dishes permanently seen in the menu of bodybuilders and individuals connected to the world of fitness (next to chicken with rice), is porridge. Prepared in various options, it is an excellent source of complex carbohydrates, which are an optimal source of energy for hard-working muscles, also supporting their regeneration. The product offered is available in various flavors, thanks to which, it will satisfy the taste buds of the most demanding gourmets. The optimal content of complex carbohydrates allows it to be adapted to the needs of people who are in the course of a reduction diet or mass cycle. 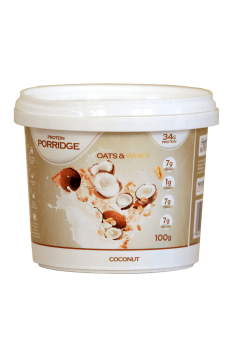 Note that the recommended product is not "an ordinary" porridge. The producer enriched it with a mixture of several forms of protein supplements, differing in absorbability and molecular target – whey concentrate and isolate as well as branched-chain amino acids (BCAA). In combination with the popular addition of many supplements, hydroxymethylbutyric acid (HMB) and glutamine, it is a highly anabolic-anti-catabolic mix that supports the development of muscle mass along with the increase in fat loss. Besides, the meal is characterized by the content of omega-3 and omega-6 acids, which are important compounds that inhibit the progression of cardiovascular disease. Daily consumption of these acids in the right amount is associated with a reduced risk of myocardial infarction as well as the likelihood of local vascular inflammation. Many ready-made meals available on the market abound in sugar or glucose-fructose syrup as to enhance their taste. There would be nothing wrong with that since rational nutrition presupposes the consumption of simple sugars within reason (up to several dozen grams per day). Nevertheless, currently, its consumption significantly exceeds these recommendations. This also involves dysregulation of hunger and satiety mechanisms, which leads to more frequent snacking. There is no such risk in relation to the porridge offered, as it has been almost completely devoid of simple sugars. With the addition of a large amount of fiber, it provides effective protection against sudden eating urge. The product can be consumed by diabetics because it does not cause sudden spikes in blood sugar. To sum up, Feel Free Nutrition Protein Porridge is a delicious product that, when included in the diet, will help to ensure an impeccable figure and a good condition of health, due to the high content of protein, omega acids, and other popular anabolic additives. Coarse-grained Oatmeal, Whey Protein Concentrate, Whey Protein Isolate, Maltodextrin, Caramel/Natural Banana/ Natural Cocoa/Natural Coconut/Vanilla, Sucralose.